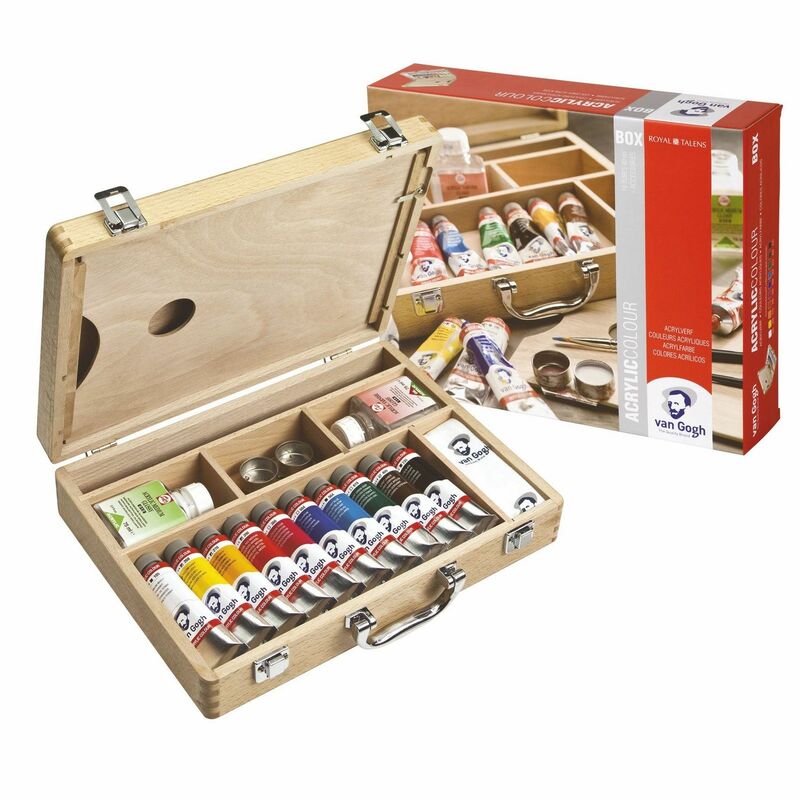 A great value set of acrylic paints presented in a beautiful wooden box. A great value set of acrylic paints presented in a beautiful wooden box. Ideal for having all you acrylic paints etc easily accessible whether in the studio painting in the studio or outdoors. The box contains:, a no. 10 & 6 paint brushes, 1 x 75ml medium, 1 x 75ml acrylic varnish, 1 x double palette cup, cleaning cloth and 1 x wooden palette and 10 sheets 24 x 32cm 240gsmacrylic painting paper block. 10 x 40ml Van Gough acrylic paints in the following colours: Titanium White (105), Azo Yellow Light (268), Azo Yellow Deep (270), Naphthol Red Medium (396), Quinacridone Rose (366), Ultramarine (504), Brilliant Blue (654), Permanent Green Deep (619), Burnt Umber (409) and Oxide Black (735).